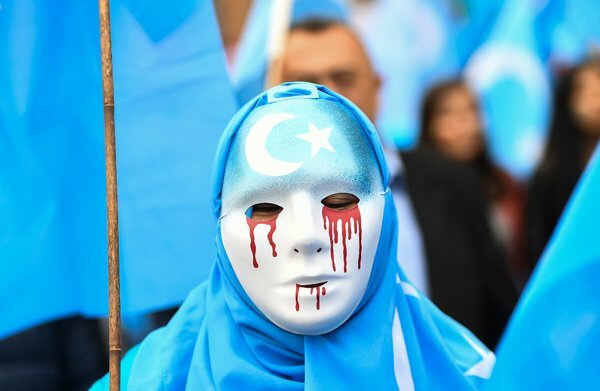 Muslims tortured and brainwashed in Chinese ‘re-education camps.’ A Muslim minority from Xinjiang is demonstrating at the EU in Brussels against the camps, posted by iStorify. “I lie awake until the sun rises, I can not sleep, the memory keeps bothering me.” Omar Bekali has been traumatised. He was tortured and brainwashed in a camp in the Chinese province of Xinjiang due to his Islamic faith under the guise of a ‘re-education’. Bekali grew up in Xinjiang, but lives in Kazakhstan and has had a Kazakh passport for years. Since his parents still live in the Chinese province, he decided to visit them. One day after arrival five armed police officers were at his door to take him away. He did not have the right to call his parents or a lawyer because he was a ‘special’ case. After four months of imprisonment and torture, Bekali was ‘released’ after a visit from a Kazakh minister. But he could not just go back home. First, he had to go to the re-education camp, where he was brainwashed along with 1000 others with the ideas and rules of the Chinese government. According to Bekali, the psychological pressure was ‘enormous’. “You have to criticise yourself, label your convictions as evil – and also your ethnic group,” he says. Bekali says he had to shout for every meal, for example, that he was grateful to the Chinese Communist Party and President Xi Jinping. He received hours of lessons about why religion is dangerous. Another woman says that she should apologise for her clothing style, her prayers and that she had given children Koran lessons. Bekali did not obey from the first day and therefore had to stand for five hours in a row against a wall every day. A week later he was locked up for 24 hours without food. After 20 days in the camp, he wanted to commit suicide.